This essay is an exchange, describing drawing as dialogue. We are two researchers – a social anthropologist (Jen Clarke) and an artist (Kate Foster) – who use ‘drawing in the field’ as a way of knowing. Our case studies arise from ongoing studies of forestry and land-use. 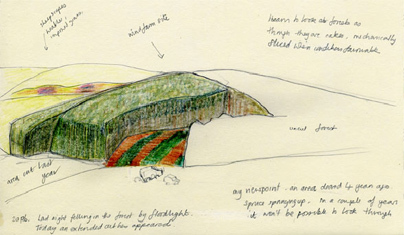 We consider field drawing in relation to ecological awareness by discussing drawing as recognition, as communication - aspects of knowledge understood in terms of awareness, and familiarity, and their opposites. In the turns of our conversations, we encounter ‘impact’, and, by rethinking it, approach the possibility of a way out, or beyond, the 'ivory tower' of academic or 'scientific' knowledge practices and of the impasse experienced in contested territories.